I wrote “Senbon-Zakura”. 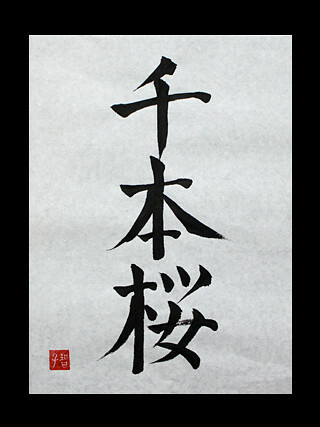 It means “Thousand Cherry Blossoms“. It’s the name of Byakuya kuchiki‘s zanpakutou in BLEACH. He is the captain of the 6th Division in The Gotei Thirteen. Eu amo Bleach, Naruto Shippuuden dentre outroa animes. Gostaria de ver alguns nomes como Toshizou Hijikata, Hajime Saitou, Harada Sanousuke. Também eu gostaria de ver como ficaria a frase: “A tranquilidade que aperfeiçoa a a espada”. Oi, Áquila! Obrigada por comentário. Toshizou Hijikata, Hajime Saitou, Harada Sanousuke, They are members of the Shinsengumi. I like Shinsengumi, too. I’ll write them. And, “A tranquilidade que aperfeiçoa a espada”, I don’t understand this well, do you know what to call that in Japanese? Is that the name of the sword, and is that going out to any cartoons? Please give me some hints.